185 miles, 8 counties, 3 ‘road closed signs’,1 ford, 1 muddy track and 1 squished banana...what an excellent ride! The carbon cutting cycle is complete! On Friday evening, I set off from my home in Basingstoke, heading north on my trusty steed ‘Merlin the Brave’ to cycle to the UK Antarctic Science conference in Norwich. The plan was to reduce my carbon footprint and choose one of the most environmentally friendly forms of transport – my bike! Day 1 saw 40 miles from Basingstoke up to High Wycombe, some great country roads and lots of ladies in large hats at the Henley Regatta. Pretty sure all the bunting they put up was for us! It was just a shame that someone put urban Reading smack bam in the middle of the route! 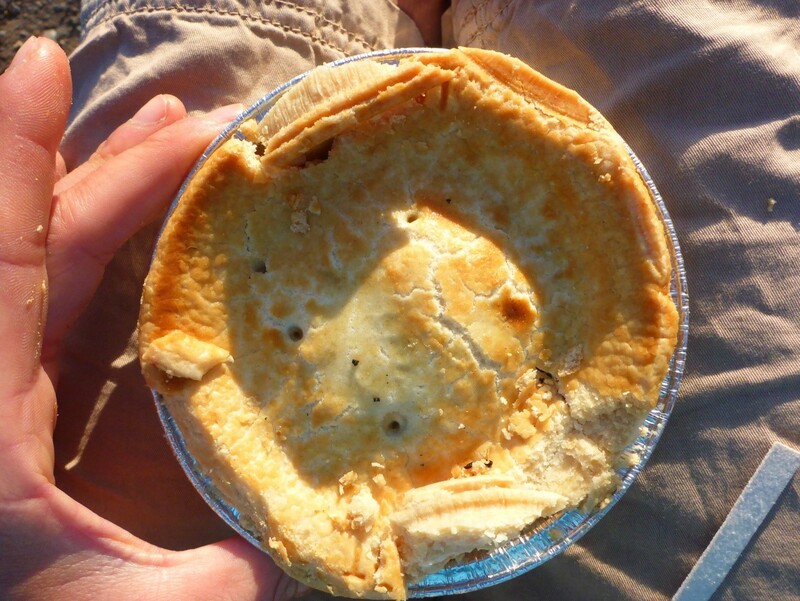 A celebratory veggie pie from the supermarket at Morrison’s devoured sat on the curb in the car park saw day 1 to a classy end. A well deserved pie for dinner! Awaking to sunny skies, time to hop back on Merlin and head off (straight up a long hill!) out of High Wycombe and up to Cambridge. 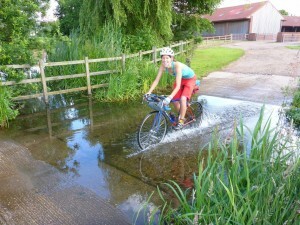 75 miles of fantastic riding, albeit not all on road with a few unexpected swampy mud tracks for bridleways and 1 ford! Merlin had a great adventure! Somehow managing to dodge pretty much all the rain showers on the forecast, we arrived in Cambridge having cycled 75 miles. Merlin the Brave goes off road! Day 3, and time for the last leg to Norwich. 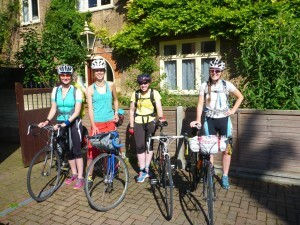 Joined now by fellow oceanographers Cecilia, Heather and Vicky, and with legs fully refuelled from some excellent Spanish themed dinner the night before (thanks to Cecilia and her housemates), I was looking forward to another day out on the bike. No muddy bridleways to sludge through today and only one slight navigational error that resulted in a near miss of the A14! Again the weather and the elevation (or lack of it!) 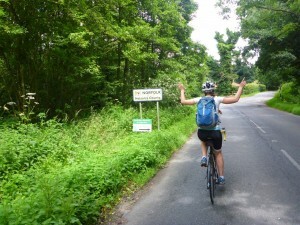 treated us well, and we enjoyed a good 70 miles of peddling through the very British countryside. We arrived in Norwich early evening for a well deserved drink in the sun, what a great ride! So if you’ve managed to read this far, you’re probably thinking, wow sounds like a lovely trip, nice cycling, nice scenery and good exercise, but what has this got to do with sustainability. Well you’d be right in a way; it was a fantastic weekend, and certainly felt more like an adventure holiday than any kind of carbon cutting sacrifice. So it goes to show that reducing your carbon footprint doesn’t haven’t to be stressful or make life difficult, it can in fact be fun and even better for you (and your research). As scientists, we are constantly travelling around the world for meetings and conferences, and although this is important to progress some really vital science that will ultimately (we hope) help reduce world carbon emissions, I think it is important to remember that our research too has its own carbon footprint. There are of course times when international travel can’t be avoided - I’m not sure I’m capable of rowing to my next conference in the USA – but where we can, we should think about holding Skype meetings, and there is definitively is scope within Europe to reduce our airmiles. I really think that we should be ‘practicing what we preach’, and that we need to continue to strive towards more sustainable research. What about introducing meat free days at the canteen of your research institution, what can we do in the lab to make sure we recycle used sample bottles, and whilst away at sea can we think more about alternatives to those endless plastic cable ties? I hope that our little sustainable cycle might encourage us all to think more about what we can do day to day to reduce the carbon emissions of our research, and I hope we have shown you how fun and easy it can be! So thanks to everyone for a great few days! Thanks in particular to the International Polar Foundation for funding my attendance of the UK Antarctic conference and to Unilink at Southampton for all their support with bike repair kit pre-cycle. 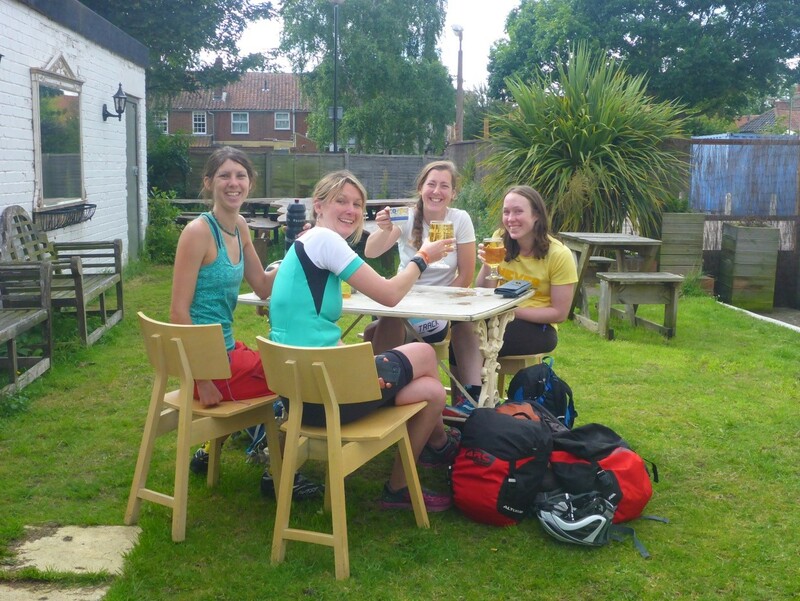 And of course, thanks to my fellow cyclists, Steve for accompanying me up to Cambridge, and Vicky, Heather and Cecilia for joining me with fresh legs from Cambridge to Norwich – a long journey is always easier, and lots more fun with good friends. Now to start the real work at the conference! A celebratory drink at our final destination in Norwich!